Enscribe creates digital audio watermark images from photographic images. 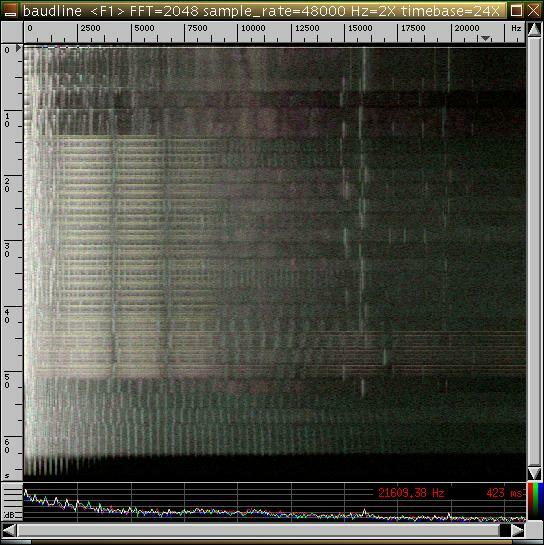 These images can only be seen using a third party frequency vs time display, such as my favorite, Baudline (http://www.baudline.com). Images are still visible even after such audio mangling techniques as MP3/Ogg compression, reverb, chorus, etc. Heavy EQ and flange can stripe out vertical sections, but they can also ruin an otherwise good song as well. You give it an image file (JPG, PNG, WBMP) and it outputs an audio file. 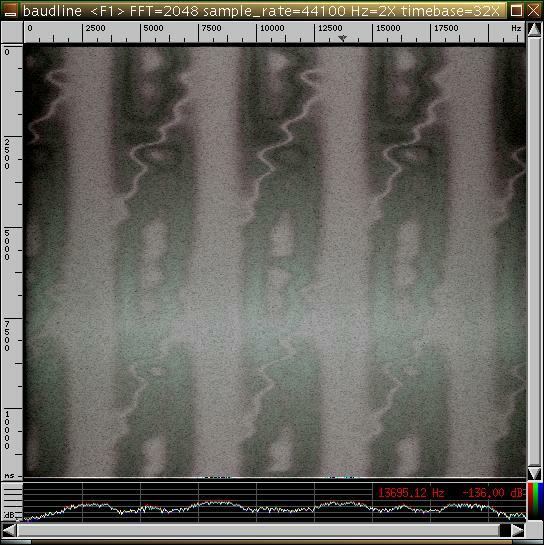 The scanlines of the input image are converted into frequency components and then using an inverse Fast Fourier Transform, are converted into sound. The left side of the image is the low frequency end, and the right is the high end, up to just under the Nyquist limit if you want it. Supported audio formats include Microsoft WAV, Apple AIFF, Sun Microsystems AU, and raw output. Raw output can also be sent to stdout. The audio images sound like high pitch buzzing or hissing. Because Baudline can display stereo images in two tone color (one for right, the other for left), color can be encoded into the audio file. It's not perfect, since there are only two color axes, and it is dependent upon your viewer, but it's still pretty cool. Baudline's default axes are green and purple, but I like red and cyan on my display. Erik Olson, the author of Baudline, had an interesting idea about encoding a third color channel using phase lag between the left and right channels. Using the "-monet" switch in Baudline activates a psuedo-third color channel based on the differences in those signals. While I'm still having trouble with getting the hues right, it still looks dang cool. Okay, what can I do with this software, you ask? You can use software such as Ardour or Audacity to blend this audio file in with another, thereby marking the audio with secret messages or pictures of your dog. You can put copyright information in also, but it probably wouldn't be long before someone figures out how to erase those (C) watermarks. I've put a precompiled linux binary for i386 here in case you just hate to compile things. You still need to have libsnd and gd on your system though. Enscribe has quite a few options, to see them all, type "enscribe -help"
Enscribe is free software, distributed under the General Public License. wb reyscale on left, inverse on right. Weird. monet pseudo 3-color for "baudline -monet" display. -mono, -m Produce mono ouput audio file. -stereo, -s Produce stereo ouput audio file (default). -rate=[rate] Set audio sample rate (44100 default). PenguinsNote that only greyscale and monochrome are supported in monoaural mode. To reduce buzzing, I recommend always using the -hiss or -oversample switches. They do reduce image quality, but they sound better, and are more impervious to digital mangling. If you are using your file in a lossless way, feel free to place your images anywhere in the spectrum, they should survive just fine. I hope you enjoy playing around with this software. Feel free to send me suggestions, bugs, or links to cool files you've made.